Lively and imaginative, the second collection of original songs from Sesame Street songwriter, Joe Romano, and award-winning singer, Susan Elliott, encourages kids to think about ordinary subjects- science, language, math- in an extraordinary way. 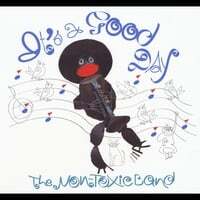 It's A Good Day is the much-anticipated follow-up to The Non-Toxic Band's critically acclaimed debut album, It All Comes Together Right Here. Like the first, this second collection is comprised of twelve lively and original songs from Sesame Street songwriter, Joe Romano, and his longtime partner, Susan Elliott. The new CD features a bilingual lullaby, a rousing rendition of a Lewis Carroll poem, and a slightly different take on a classic fairy tale, Cinderella, and includes three of Joe's most popular Sesame Street compositions, "Five Pigeons On A Telephone Wire", "Try, Try, Again", and "Smile". My daughter has been a Non-Toxic Band fan since she was knee-high to a bumble bee. We were very excited when the buzz about this new album started and couldn't wait to listen to it. What fun! Even in the car these tunes inspire us to sing, boogie and laugh. Joe Romano and Susan Elliott's voices are as sweet as honey and these songs have inspired lots of conversations as my daughter explores the world around her. I highly recommend both Non-Toxic Band albums for families. They are especially fun to play during play dates and birthday parties!